Marisol Guzman has deferred college for a year to accomplish two things: She will write a novel and she will fall in love. How hard could that be? She gets her very own apartment (with her high-school best friend as roommate) and a waitressing job at a classic Harvard Square coffeehouse. When she enrolls in an adult education class - "How to Write Your First Novel" - there are two big surprises waiting for her: John Galardi, aka "Gio", a fellow zine writer who fell head over heels for her last spring (despite the fact that she's a lesbian) and her instructor, Olivia Frost, the most exquisitely beautiful woman she's ever seen. But as Marisol ventures into what seems to be her storybook romance with Olivia, things start to go off track. Between the ups and downs of her new relationship, her strained friendship with Lee (a newly out lesbian who is crushing big-time on Marisol), and her roommate's new boyfriend (who is equally afraid of Marisol and their cat) moving in, Marisol starts losing sight of her goals. Is she too blinded by love to see the lies? 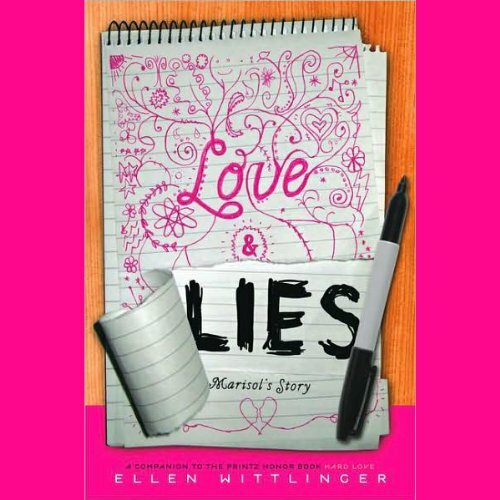 In this long-anticipated companion novel to the Printz Honor Book Hard Love, which critics called "A bittersweet tale of self-expression and the struggle to achieve self-love", Ellen Wittlinger offers a novel just as emotionally honest and deeply felt. ©2008 Ellen Wittlinger (P)2009 Audible, Inc. Either way this an excellent piece of fiction for both the adult and YA markets. This is one of the few lesbian themed books that was able to overcome the romance genres worst cliches. Okay maybe I'm just guilty of totally over relating to Lee and Marisol. I'm a 19 year old out lesbian who is probably more similar to Lee than I'm totally comfortable with. My big sister Stacy reminds me a lot of Marisol; very strong, extremely confident, and seems to feel no trepidation even when she's encountering a person or situation where some fear might be warranted. Then there's the character of Olivia who is an advanced version of the high school mean girl b***h that most of the girl's in her class are scared of. Being on the receiving end of attention from that girl created dread to the extreme and created nausea if you found yourself in one of her classes; especially when you were walking in the halls between classes. They always managed to find acolytes who lived to kiss their ...rings. Then way too often they would turn on these girls using information they'd gotten from them supposedly in confidence. Some of the minor characters in the books seemed to be kind of formulaic; particularly her roommate and her mother. The mother in particular is a little too over the top. Although Stacy's dad is sometimes kind of like that for us. Which reminds me if there are spelling or grammatical errors, blame him. This is a really great listen; even for people who aren't 19 year old lesbians; give it a shot. Love is a funny thing isn't it? Marisol Guzman is a young woman taking a year off from Stanford in order to write a novel and to find love. Marisol was hoping to find peace and comfort in her apartment in order to concentrate on writing her first novel. However, she doesn't get her wish. Her gay roommate, Birdie, who is her childhood best friend, has fallen head over heels over a man and asked him to move in without consulting with her first. In addition, while enrolling at an adult continuing education class on novel writing, she discovers that Gio has also enrolled. Marisol is awkward because Gio was once in love with her and he seems to be trying to get over her. Meanwhile, at The Mug, where she works, Marisol has befriended a young recently-outed lesbian, Lee. Despite the chaos in her life, Marisol is high on infatuation and love. Olivia Frost, the one teaching the class, is stunningly beautiful and intelligent. Before she knows it, boundaries are blurred and they are girlfriends. Love is grand, right? Not for Marisol because her relationship with Olivia soon takes a nosedive. Plus, there's Lee, who isn't sure of her feelings. And Gio, who seems to have move on, still brings up the past. Just what is Marisol supposed to do? Her salvation to the surrounding chaos is her novel, which she seems to have a natural talent for writing. The characters and the plot in her story are a reflection of her own life. Nonetheless, it is therapeutic for Marisol. Overall, I really enjoyed this book by Ellen Wittlinger. She does a fantastic job of making another (Marisol's) story within the book. I was a little hesitant because of the techniques and exercises that the writing students had to do. However, Wittlinger didn't disappoint me because the developing story was just as interesting. Plus, there's plenty of drama to keep you interested. Having roommates, drama is guaranteed. Jealousy and lies are a-plenty. An overbearing mother and a sister just cannot stay out of other people's lives and resentment is bound to rear its tempermental head. Again, an enjoyable read and I would recommend my friends to read this book. content was okay, performance was terrible. Would you try another book from Ellen Wittlinger and/or Anne Marie Lee? I would never listen to anything narrated by Anna Marie Lee again. If I could have given her performance zero stars I would have. This is a story being written from the perspective of a 19 year old lesbian. This woman read the story as if it were a wistful children's story geared towards toddlers. Her voice never drops at the end of sentences. It was painful, I almost didn't make it past the first minute. Since I paid for the book I forced myself to get through it. No self respecting gay woman would say "Annie Difranco"! Too bad this woman did a terrible disservice to Ellen Wittlinger. I would have liked to hear this read by a younger performer who is actually in touch with the twenty-something lgbtq community. Would you recommend Love & Lies to your friends? Why or why not? The print book, sure. NOT the audiobook. I might not have hated this if I had read it instead of listened. The narration was terrible. Most of the characters (whom were all in their teens and early twenties) were voiced as if they were 45 years old. And haughty in a Thurston-Howell way. The main character was mostly unbearable, too pretentious. The story was so predictable. It would probably do well as a lifetime move. I probably should have stopped listening early on, but I kept it up, thinking it just had to get better. Not so much. (That's how I ended up watching the entire movie of The English Patient, too, even though that was horrible.) Save yourself. Do not listen to this. If you must, find a print or electronic copy to read.